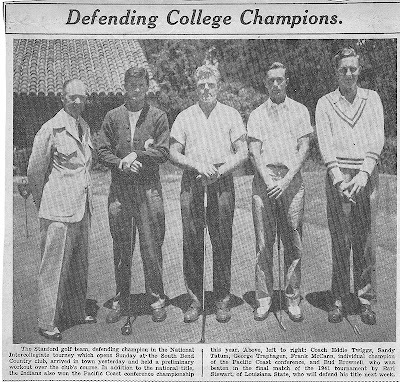 Sandy Tatum, class of '42 at Stanford, is a large reason TPC Harding Park Golf Course in San Francisco is hosting this week's Charles Schwab Cup Championship. Tatum played in 40 city golf championships at Harding Park as one of the Bay Area's top amateur golfers. "I came back and took a look at Harding Park and realized it was turning into a weed patch," Tatum said. "I couldn't bear that thought. I'm a friend of Chuck Schwab's. I said to Chuck, 'Somehow, we need to try to save it. The only way to save it is to get the tour involved.'" Schwab talked to PGA Commissioner Tim Finchem about bringing an event to Harding Park. "Chuck arranged a dinner with Tim Finchem, Chuck and I," Tatum said. "I explained to Tim what I thought was available here. I thought the Tour would be passing up an opportunity if they didn't come here because it's one of the best markets in the whole country. He told me at that dinner if his guys confirm what I was telling him about Harding Park, he'd be on board. That got it going." Tatum, now 91, was part of two NCAA championship teams while at Stanford (1941 | 1942). He won the individual title his senior season at Notre Dame Golf Course in South Bend, Ind. "It was more than exciting," Tatum said. "It was mind-boggling. I played well for a lot of years, but I never thought I could be that good. In that particular setting, I was. 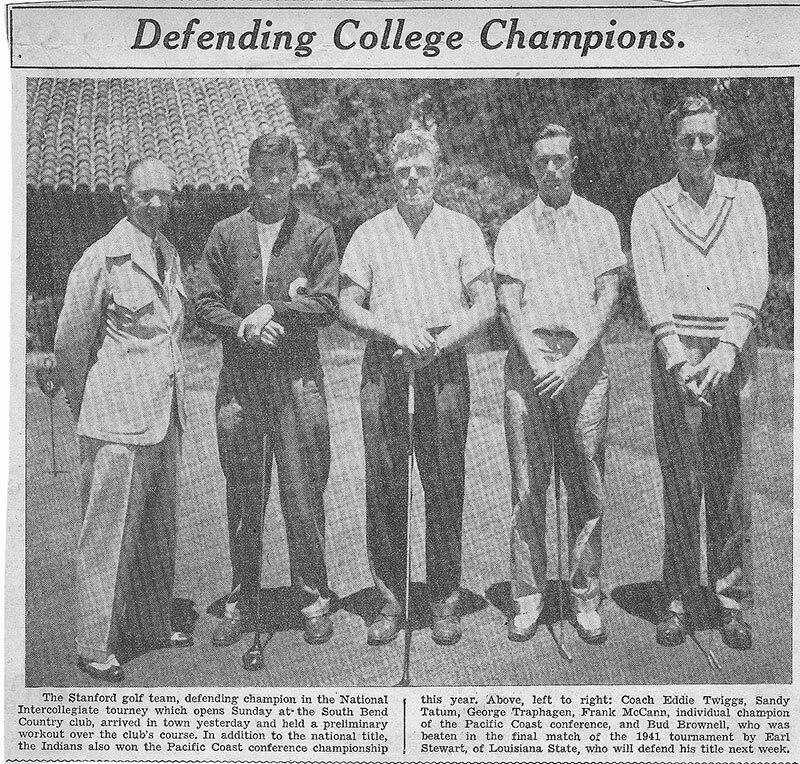 Playing golf at Stanford was one of the most important elements in that whole experience. The golf course, golf coach Eddie Twiggs, the players, the whole scene was added dimensions to that experience." Frank Donovan "Sandy" Tatum Jr. chose Stanford after being influenced by his older brother, Don, who had attended Stanford before him. "Stanford experience was the answer to a dream," Sandy Tatum said. "I had some exposure to the place because of my brother. He was eight years older. I told myself, 'I'm going to set my sights on Stanford. If I could just get there, I'd have that dream realized.' And it was. Those four years were the most effectively important years of my life. It also matters to me to see how much that institution has developed. It has been amazing." Tatum, an engineering major, was in the Navy three years during World War II. When he was stationed in Arizona, Tatum befriended Stanford golf great Lawson Little, class of '34. "They dealt with me in a remarkable way," Tatum said. "They sent me to the University of Arizona for an indoctrination program. I was there for two months. The place was wonderful. One of the guys there was Lawson Little. We played an exhibition match for the Red Cross. That's how my Navy career started." Tatum was transferred to the University of Michigan, where he got a nine-month crash course in Naval architecture. "It was fascinating," Tatum said. "There was a great golf course there, so I played a fair amount of golf. They then sent me to the San Francisco Naval Shipyard where they put me in charge of ship modeling and repair. The admiral there was a golf nut. So I played a lot of golf during the war. I don't deserve to be identified as a war hero." Tatum went to law school after he got out of the Navy, abstaining from going professional as a golfer. "It never occurred to me to go pro," Tatum said. "It wasn't that I didn't think I could play that well. The life they led didn't appeal to me. I started practicing at a small firm and we did everything. I loved it." Tatum, still practicing law after 62 years in the profession, has stayed connected to golf in various ways. Tatum served as president of the United States Golf Association from 1978 to 1980. He was on the USGA executive committee from 1972 to 1980. Tatum was involved in the design and development of The Links at Spanish Bay golf course in Pebble Beach. He codesigned Lockeford Springs Golf Course in Lodi and Mount Shasta Resort in Mount Shasta. After 55 years living in San Francisco, Tatum and his wife, Barbara, moved to Hyatt Residence near the Stanford Shopping Center. "I told my wife, we're going off to the sunset in real style," Tatum said. When he finds time, Tatum plays some golf. "I'm so grateful to be out there swinging at it, I could get down on my knees and weep," he said.